Goerlich Quadruplets: Day 2 - We Made It! I know you checked the blog 1st thing in the AM the other day, didn't see a post; checked again the next day, didn't see a post; checked this AM, didn't see a post, and began to wonder if we made it or not. Well, let's say we are alive right now to talk about it. No, it really hasn't been that bad. 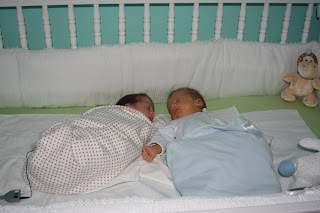 Cohen & Sophia sleep well and eat very well. The trick has been to wake them to eat before they wake us. Knowing that we have 2 more still to come home makes twins a piece of cake. Cohen & Sophia had their 1st pediatrician appointment yesterday with Dr. Herman (what is it with this connection to the name Herman?). They did well and are looking healthy. He told us to limit the amount of exposure to people and crowds for the next 3 months because at this stage, the babies immune systems just aren't strong enough. The blood work came back on Noah, and the little dude has a bladder infection - we all know how much those hurt! He has been on the appropriate antibiotics for a few days and is already feeling better. The nurse told us Noah did not have any bradys yesterday! The surgeons consulted a pediatric GI specialist, Dr. Roads, to check in on Noah to see what he thinks. Dr. Roads said that since Noah is not getting fed by mouth, he is not able to use the pancreatic enzymes used to break down fat and protein. So he started Noah on Elicare, a formula specially designed with these enzymes so that he can process the protein and fat in milk. He also met with the surgeons last night to discuss re-connecting his intestines, but also said that Noah had to complete 2 weeks of antibiotics prior to surgery. According to his nurses, Noah is tolerating these feedings very well and gained a little weight. They are still assessing Finn's response to the reflux meds to see if they are working. They place him on oxygen during feeds to help with this, but as of now, they don't think he'll need to come home with oxygen. We miss Finn and Noah right now and will hopefully be able to see them this weekend as Mari's parents fly in today - yea - help!! Busha has been at the hospital loving these 2 little guys everyday and we are so appreciative of her love. The past few days have been awesome! Yesterday, we got the house scrubbed down from top to bottom while the babies were sleeping --- thanks Merry Maids courtesy of NW Houston Mothers of Multiples! We are also back to eating homemade meals --- thanks Jen for coordinating meals. The Community of Faith meals team will spring into action over the upcoming months for us. What a huge blessing! Aweeee, they look so happy to be home:) Love you!!! To God be the glory! Sounds like you are all doing a fantastic job, and loving every minute of it. I know that Mari's parents will be of great help to you. Rejoicing in the news that Noah's problem is being solved and healed, and hoping Finn will soon join the home gang. Welcome home!! I am glad to hear that things are going smoothly at home for all four of you. Let me know if there is anything we can do for you. It does my heart good to see Sophia and Cohen home and together with their wonderful parents. 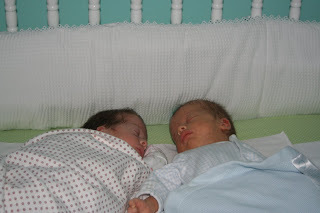 Now continued prayers for Finn and Noah - all those babies need to be together!!! I'm thankful you find the time to post at all. We have been spoiled with so many daily updates - and realize that you are going to be very busy and daily updates may be a thing of the past. Sweet peas! I hope you guys are getting some sleep (thank goodness for grandparents)! Also, Steeplechase Pediatrics ROCKS--Dr. Herman and Dr. Garza are the best! :) Let us know when everyone is healthy enough to visit! Yea!! You made it home. The babies look so very happy and comfortable. Soon Noah and Finn will be home too. Hey, Dr.Herman & Dr.Garza are great! In fact Dr.Garza & I went to High School together & I taught one of Dr.Herman's boys when they were in PreK. They were always there when the kids got sick (now 22 & 19), even on the weekends & especially emergencies. Dr.Garza was always Dr.Mario to my son, Nick. I have shared your blog with others at my school and there are many people praying for the health of all your precious gifts. Enjoy every moment for as they do grow up WAY too fast. I wanted you to also know how wonderful your slide show of the quads "Birthday" was... as a mom I was in tears. God is truly working throught the both of you to teach many others patience and faith in God's awesome work. Rest as much as you can & may God bless your wonderful "new" family. Congrats on bringing Sophia and Cohen home. I keep thinking of the 5 of us standing around and not knowing what to do when Madeleine came home last year. Yes, the 5 of us for one baby and feeling overwhelmed. That all seems pretty silly now with two and then two more coming home, but if there is anyone that can do this it is the two of you. I can't wait to see you all. We are so glad that everything is coming together. God bless y'all. Yea!!! Two home and two to go! We continue to pray for all six of you! I know your family is helping now, but please call COF if you need us to do ANYTHING at all!! We are anxiously awaiting the day we can meet the babies in person! We love you all! It's wonderful to see and read that all is going well on the home front - God is so good! The kindergarteners will be so excited to see the photos of Cohen & Sophia and to hear the update on Monday. We continue to keep Finn and Noah's progress in our prayers. We're looking forward to the picture of all six of you at home! I have been following your story, ever since one of our Mom's (from our multiples group) posted your webpage. We are the proud parents of quadruplets, who are 4.6 years old. It has been hard, sad, joyful, heart breaking and just plain rollercoasterish to read your blog!!! I SO remember those days of waiting, praying, hoping, crying, laughing, sobbing, shaking, praying, standing strong and collapsing and praying more!! You have both done a great job and are reaping the rewards of your faith. God bless and hug those little beautiful children from our children. Just so you know that all things are possible with God, our oldest quad (Corday) expired twice while in the NICU (plus, had heart surgery at two weeks, plastic surgery at three weeks, etc, etc)they did CPR both times to get him back to us and he is now standing on his head behind me yelling "mom, mom, look at me!!". Hope you enjoy our webpage and feel free to email us at anytime with questions from the mundane (how do you handle all the stares and comments?) to the important (how do you find time for you as a couple?). God has blessed you, your children have blessed you and now you need to bless yourselves - charge on. I'm so happy to hear that Cohen & Sophia are doing well at home and I pray that Noah & Finn will be joining them soon. I am curious to know how Jaz is adapting to all of this change and excitement. Please let me know if you need anything. Hi! Hope you are having much fun with your two bundles of love. I pray for Finn & Noah to be home soon. All things are in God's hands and his are mighty hands. He will cover them and protect them.